DD Free Dish will conduct yet another e-auction to fill up its vacant slots. DD Free Dish has given advertisement about this e-auction which will be held on 9th May 2017. This e-auction is meant for filling vacant slots for non news category and current affairs category. 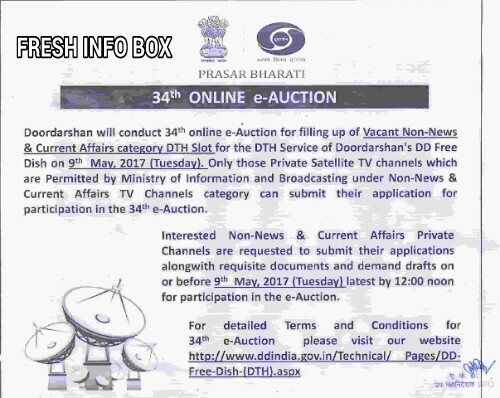 The e-auction of DD Freedish channels will be held on May 9, 2017, this process will be completed by the evening and the channels which will win in this auction will be announced next day. E-auction is expected to join some new channels sometime and the licenses of some channels will be renewed, some channels which will not take part in this auction and removed those channels whose license has expired after completion of 1 year This process will be completed in the coming days. You will get all the information related to the connection of channels and the process of adding new channels and frequency here On Fresh Info Box. Stay connected with us and enjoy the new channels on DD Free Dish which is absolutely free! The advertisement is shown below. Terms and Conditions of 34th e-Auction to be conducted on 9-05-2017 (Tuesday). Press Advertisement of 34th e-Auction to be conducted on 9-05-2017 (Tuesday). Bidder Registration Form of 34th e-Auction to be conducted on 9-05-2017 (Tuesday). Bidder Manual of 34th e-Auction to be conducted on 9-05-2017 (Tuesday).